There's nothing like a world-class city to stir a sense of wanderlust and adventure. 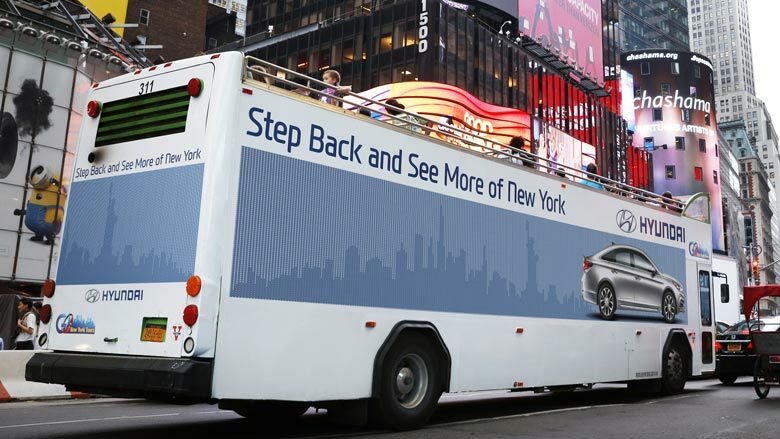 Join Hyundai for a unique spin through New York and see the bigger picture as you take in the local neighbourhoods where the secrets of each city live. Fit for every adventure, Hyundai is your ultimate travel companion, wherever the journey takes you. “Don’t give the people what they want. Give ’em something better” - theatrical impresario Roxy Rothafel said this once. You could say Rothafel succeeded in his mission to dazzle us as he created Radio City Music Hall, but he could just as well have been talking about New York itself. This is a city where one sight is more magnificent than the last, but its true magic isn’t about being grandiose - it’s about how this city feels. Whatever it was that people wanted, with NYC we got something even better. The best place to tap into the spirit of NYC is at street level, waiting at a dangling yellow traffic light as you pass through the city’s street grid. Manhattan hasn’t got an inch of space wasted, and the saturation is palpable, whether it’s the people rushing along between meetings, or having a slow brunch on a well-earned Sunday off. It’s hard to go wrong as the city contains the best of everything: the best food, the best shows, the best times, and the best hopes and dreams. For an overview head to Midtown, and climb 266 metres up in the air. 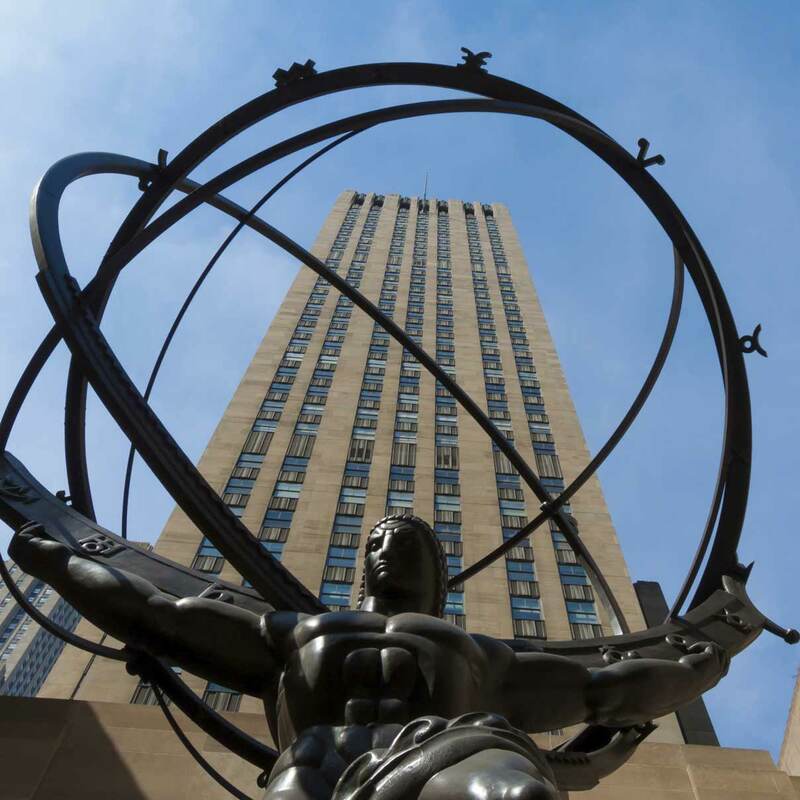 The Rockefeller Center is the star of John D Rockefeller Jr’s vision of a “city within a city”, and Manhattan really does feel like an island up there. Peering down, the streets stretch out in straight lines in every direction, as hundreds of skyscrapers are surrounded by two rivers. But despite the density of buildings, the sunlight reaches all the way down to Manhattan’s avenues. The city’s distinctive setback architecture style was mandated back in 1916 to ensure this would be the case, as residents called for more light and air as the city around them was turning into the ultimate metropolis. The result included two of New York’s most beloved wayfinders: the proud, towering Empire State building, and the shining, elegant Chrysler building. If you’re lost, just turn around and you can usually find at least one of them in your line of sight. But not all showstoppers are all that that obvious. 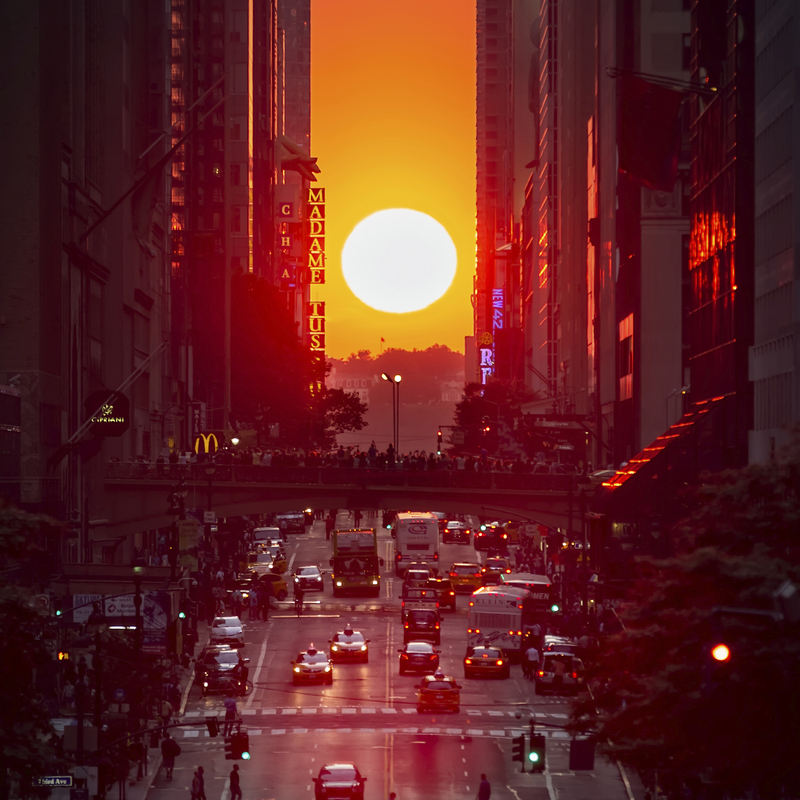 Some, like Manhattanhenge, only happen twice a year. 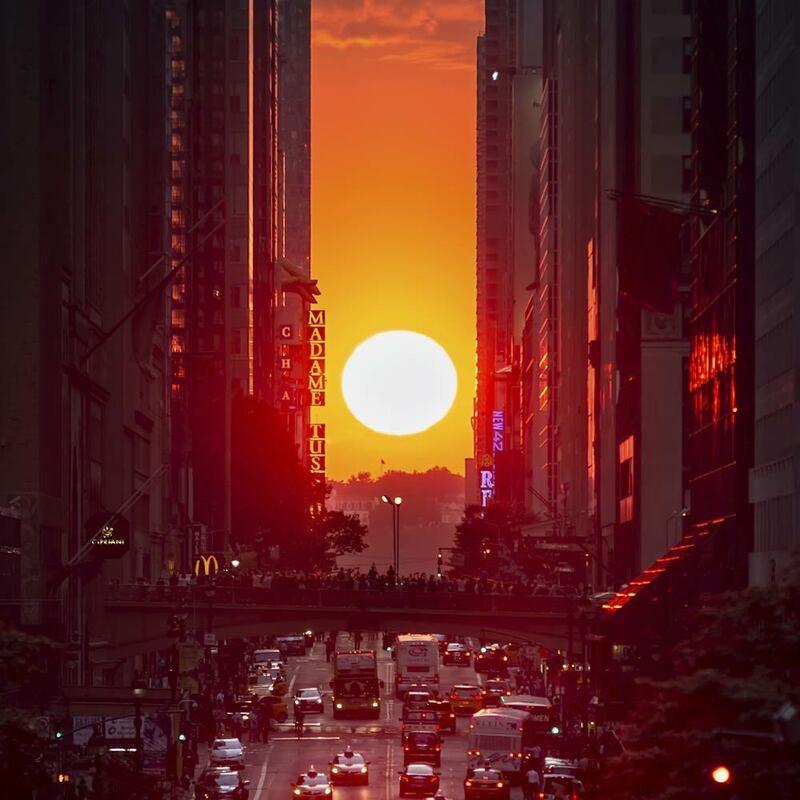 This is the phenomenon when the sun sets perfectly in alignment with Manhattan’s east-west streets. For a brief moment, the city stops to witness the sunset as it turns the city’s urban canyons golden. Other NYC gems are there all year round but they’re so subtle you could easily miss them, like the curious Max Neuhaus sound installation hidden in plain sight. You’ll find it amidst the chaos of Times Square, a maddening place that overwhelms your senses with its wall-to-wall flashing billboards, the endless crowds and constant traffic. But there’s a spot there, right at the tip of the triangular pedestrian island, where you can hear a deep hum rising up from the ground. It’s loud enough that you’ll definitely hear it, but soft enough that unless you knew what to look for, you'd dismiss it as a part of the chaos. New York's strict grids and stark angles often demand that people adjust to its temperament, but sometimes there's a building that does things the other way around. Like the Solomon R Guggenheim Museum, an organic structure if there ever was one. The round, swirling exterior continues inside, guiding you through the museum space as if it intuitively knows how to interact with people. Around the time of construction, architect Frank Lloyd Wright was accused of creating a building that might overpower the art it houses, but Wright disagreed: "On the contrary, it was to make the building and the painting an uninterrupted, beautiful symphony." Speaking of an uninterrupted flow, the 5th Avenue location of the Guggenheim was no accident either. 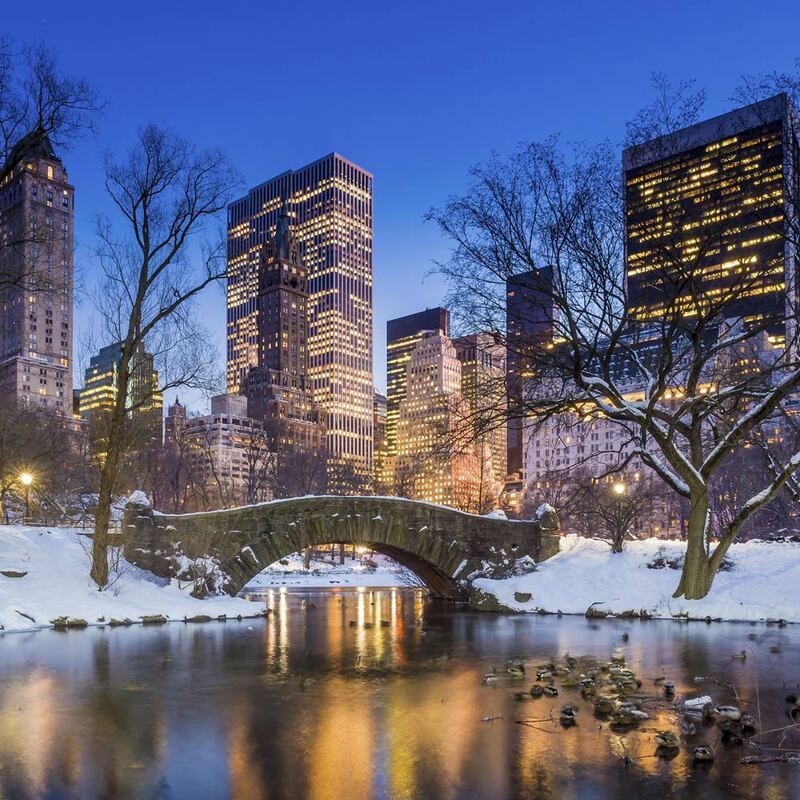 The building backs onto Central Park, a rare spot of respite from the exhilarating, exhausting experience that is New York. An organic building in a stark grid is a relief, just as a spot of green in a steel and concrete landscape is quite literally a breath of fresh air. But as you walk through Central Park, skyscrapers peek up behind the trees in every direction, never letting you forget where you are. 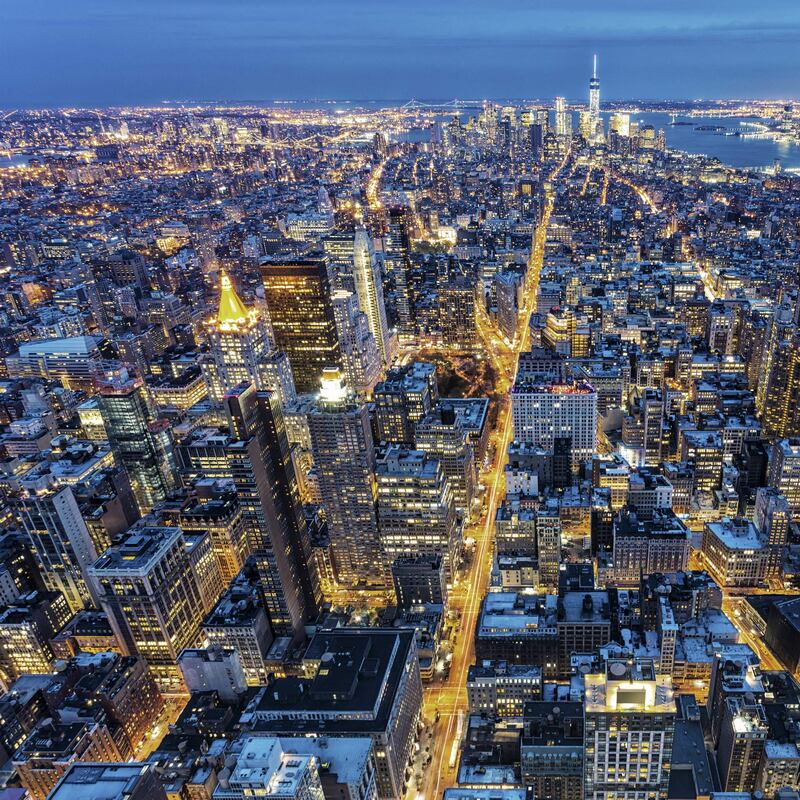 As Billy Joel almost sang, New York is a state of mind.